Onychomycosis or nail fungal infection is caused by fungal organisms, such as dermatophyte. Fungi can become a major problem if it is allowed to overgrow. Mostly, they would be manifested under the nail including fingernails and toenails. Since these infections take a long time to be conspicuous, it might be too subtle to notice any change in the appearance of your nails. The overgrowth of fungi under nail causes a fungal nail infection that can also be visible on top of the nail. Fungus under nail will grow faster in the toenails because of the conducive environment that supports their existence, since fungi naturally thrive in warm and moist environments. Dermatophyte is the same fungi that result in common conditions such as athlete’s foot, ringworm and jock itch. These fungal skin infections known collectively as tinea. Toenail fungus not only changes the color of your toenail but also makes it thicker. They may break easily in irregular shapes when confined in tight shoes. Dr. Richard Jacoby elaborates more on toenail fungus causes (eg. diabetes) in the brief video below. While it is likely to spread from one individual to another through contact, toenails are the parts which are mostly affected compared to the fingernails. Tools used in pedicure or manicure are some of the procedures that can lead to fungus under nail, too. Consult the staff at the nail salon to determine how often they disinfect their tools. These include nail clippers, emery boards, and any other nail material. Fungal infections will spread from one individual to another due to the failure of sanitizing these tools effectively. The following video from WebMD elaborates more on toenail fungus infection from pedicure. They tend to have an odd shape or distorted. They are also thicker than usual and can easily break with a little pressure on them. It is also characterized by a dark color caused by the building up of debris under your nail. Nails will smell slightly foul and has a white or yellow discoloration. The fungus that builds up under the nail is likely to separate it from your skin. This is because it tends to loosen the deeper the fungi spread. In severe cases, the fungus can spread to surrounding skin if not early treatment is administered. Some experience a white dot on top of the nail that grows bigger over time. Who Can Be Affected by Nail Fungus on Feet and Hands? This type of fungus tends to affect men more compared to women. It is more likely to be manifested in men than women. Your chances tend to be higher the older you are and there are people who are also at risk. This includes people with weak immune system, diabetes, athlete’s foot or smoking habits. If the infection is detected early, it is advisable to get early medical attention to minimize the severity of the condition. Your healthcare provider may recommend procedure like laser toenail fungus removal. Such treatment is not cheap though, as it can easily cost over $1,000 — as mentioned by ‘The Doctors’ in video below. For instance, New York City Podiatrist is charging $1,200 per toenail fungus treatment procedure. Your doctor may prescribe oral antifungal medication, and you will be required to take these medications for several months depending on the types and severity of the infection. Some of the oral antifungal medications that may be used include Terbinafine (Lamisil), Itraconazole (Sporanox), Fluconazole (Diflucan), and Griseofulvin. You may look for OTC products that contain a natural fatty acid extracted from castor oil, called Undecylenic acid. This is an antifungal active ingredient approved by the US FDA. including studies by The American Academy of Family Physicians and University of New Mexico. One leading topical nail fungus treatment solution in the market is EmoniNail, which contains Undecylenic Acid as its key ingredient. The other natural ingredients in EmoniNail with clinically-proven antifungal properties include essential oils like Tea tree oil, sunflower seed oil, etc. >> Visit EmoniNail official website here to learn more. There are some measures that you can take to reduce the chances of getting fungus under the nails, and prevent recurring nail fungal infection from keep coming back after your treatment. Always keep your feet dry and clean, since the fungus breeds on wet and warm environment. Wash your feet with soap and water, then thoroughly dry them well with a towel. 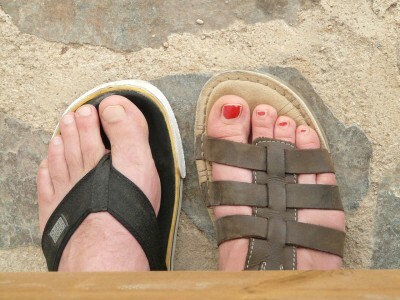 Trim your toenails to be shorter, to help prevent debris from building up under the nail bed. Treat your shoes with anti-fungal powders or spray. Rotate your footwear daily, allow them to air out between wearing. The tools used in manicure or pedicure should be sanitized or disinfected. Don’t use polish to cover up your discolored nails. It will prevent fungus from going away. ← 5 Epsom Salt Foot Soak Recipes for Toenail Fungus Infection, Feet Pain, Swelling, Sprains, and more.